Long time lurker...finally decided to post. I'm at my wits end with our 2012 Mazda 3 Hatchback GS Sky. Car has 124000Km on it and P0303 showed up about 2 months ago, figured it was the plugs so I purchase a set of NGK-ILKAR7L11 to replace the factory plugs. Plug from cylinder 3 had alot of carbon on it. Replaced them all, erased the code car was fine for a few days then the code came back. Searched online about the misfire codes and found a Mazda TSB that talked about updating the ECM to the latest version to address the problem. Brought the car to the Sudbury, Ontario Mazda dealership with the TSB and the plug i replaced from cylinder 3....service guy didn't seem to enthused about what I brought him and wasn't convinced that was the problem. Couple hours later I get a call from the dealership telling me they would need to removed the cylinder head and decarbonize it, all for $600. I said "uh I don't think so", went to canadian tire bought a can Seafoam with the red plastic straw and ran one can through the intake, then went for a spirited drive..without the wife of course!....Code didn't go away. So read some more posts online and decided to take the intake manifold off and went ahead sprayed them with seafoam then sand blasted all the intake valves with crushed walnuts. The valves came out nice and clean. Put everything back together cleared the code and it ran pretty good for about a week, then P0303 came back. So I started thinking maybe I have a bad coil pack, so I swapped the coil pack from Cylinder 3 with Cylinder 1, removed cylinder 3's spark plug and cleaned it with brake cleaner cuz it was starting to have crud on it. Cleared the code and a couple days later I got P0303 code again. I was hoping I'd get a P0301 then I would know it was a bad coil....but no luck. So that's where I am now....what the hell do I check next??? Do I take the cylinder head off and clean the crap out of it?? Thinking of taking the EGR off and cleaning that, but not sure if that will make a difference. Sorry for the long post, but I'm about to put a pick axe through the hood. EGR would cause more of a random/multiple cylinder misfire. you could have a dirty/clogged fuel injector. swap coils around, recheck. swap injectors around, recheck. if none of those fix the issue, i'd check compression. if compression is bad, you could have a bad/broken valve spring, a burnt valve, or carbon'd on valve, so it doesnt seat firmly. I guess I should also rename the Engine/Drivetrain section "Arts & Crafts"
Thanks for all the suggestions. I'll work on it this weekend and post an updated. Sorry yes.....I pulled all the plugs and I had gapped them wrong. Regapped all the plugs according to the Mazda owner's manual. Cleared the Check engine light, ran really good for about a week, then the check engine light came back with the same P303 code. So now I have absolutely no time to look at it again (building a garage).... so it's going to the dealership on Thursday. you said cylinder 3 plug had crud all over it. your valve cover seals arent leaking into the spark plug holes, are they? you could try the ole italian tune up, and just drive the crap out of it, and a lot of high revs, but im concerned, if theres carbon build up, that a piece will let go, and cause valve train damage. Yeah the head will probably come off and be de-carbonized.....all i have to say it better f**** work when I get it back. I put half a can of seafoam in the tank last fill up and drove the crap out of it. Shifting near red line on every gear for about 40 km coming home from work. Didn't make a difference! It idles like absolute crap...the rpm's go down close to 500 and it just sputters then goes back up to around 750. So here's an update. Brought the car in to the Sudbury Mazda dealership on thursday...took them half a day to complete the work. Walked out of there with a $450 bill, worked performed: remove intake manifold and clean intake valve as per tsb. Check engine light came back on Friday afternoon!!! Let's just say I'm not real happy right now, my wife even less....she's showing up at the dealership on Monday. Sorry to hear about your issues at the stealership. Sounds like the only thing left is the fuel injectors. Maybe swap one from another cylinder and give that a go. See if the issue transfers over. Does it seem to run fine at the higher rpms? It feels sluggish until you hit around 4K rpm then it pulls better. But idle and low rpm's it runs rough. I'm thinking it's a bad injector or clogged injector. So I get in the car last night after to work and I immediately notice that it's not running properly. It was really sluggish, it kept shifting up too fast and the car was bogged down, step on the accelerator and it wouldn't shift down. So I drove it for a bit and finally had enough and pulled over to the side of the road and opened the hood. look what I found! It was wedged between the fan shroud and the intake manifold....i guess the mechanic was in a hurry to get my car out of the shop. Piece is part of the air breather assembly and it was sucking hot air from under the hood instead of cold air from the front of the car. As soon as I put it back in place PROPERLY the car started running properly. The check engine light went off and it seems to idle properly, wondering if that was the reason the check engine light came back on after it came back from Mazda. I didn't bother scanning it as I was sure it was the same code. Glad you fixed it. Ya fuel needs air to burn. Confused though that they took off the manifold after the problem occurred. 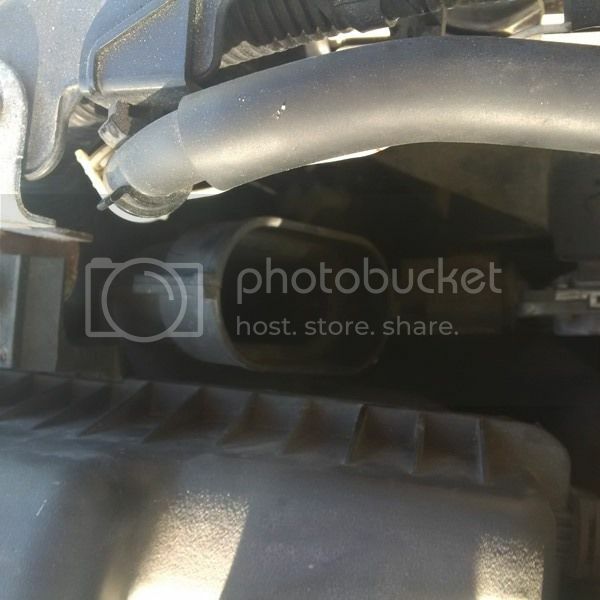 Did they not look just past the airbox and see this issue? Yes they took the whole airbox off, plus the intake manifold to clean the intake valves. The engine light came back on 2 days later. I didn't bother scanning the code, assuming it was still P0303, but it might have been a Air Intake Sensor code or something. I'm guessing that the airbox piece wasn't in place properly when it came out of the shop and finally fell off completely. That's when the car really started running like crap. Hard to say what really happened there, just glad the check engine light is off and that the car is running properly now. As a point of interest, I removed mine a while ago and it drives just fine without the snorkel in place. 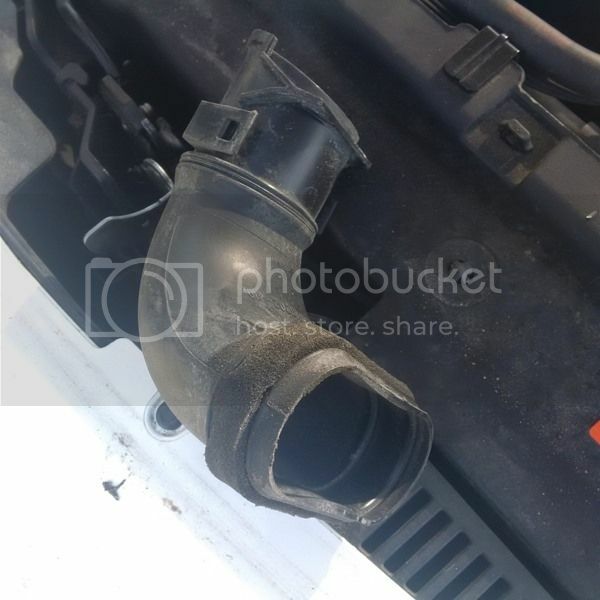 Yes, the intake air temp goes up by about 6 degrees once you get moving, but I found that removing this and the intake resonator improved fuel economy, engine growl and feels a bit torquier. Very interesting! I have no clue what the hell was going on then and why when I reinstalled it it started running better. Was it jamming the cooling fan, by any chance? No it wasn't but it was pretty close. The snorkel wasn't the problem, the check engine light came back on yesterday with the same P0303 code. Drove it for a while and it went away again. Quick update on this whole situation. Check engine came back on, then went off again, car ran fine....engine light came back on last week and my wife lost it, drove the car to the dealership and tore them a new one. So they take the car in the shop (that morning) and come back and tell her that cylinder#3 has to be replaced because it's not holding pressure. A car with 128k needing a cylinder replaced??? I have a feeling it's related to one of the valves not seating properly and leaking....am I right to think that? Now I have to clue what to do...the only thing that comes to mind is to take the head off and do a visual inspection. I guess I could also do a compression test, then add a bit of oil on the piston and do compression test again and see if it's the cylinder or valves? right? You can't replace a cylinder. Replace the head, valves, piston etc, but the cylinder is one piece of the entire block. Having said that, they're saying one cylinder isn't holding pressure, which could definitely be a bad valve and could easily happen at that mileage or earlier.. But I also can't confirm if it would explain your issues. Yes sorry that's what I meant....they are saying that piston#3 has either worn or broken rings. I just bought a USB borescope camera...I think I'll drop it inside and take a look and see what it looks like in there. If the rings were worn or broken...would I not get gas in the oil eventually? I smelled the oil and it doesn't smell like gas at all. Just an update. After a running seafoam in the gas tank a few times, the check engine finally went off and has been off for over a month now. I think I had a combination of dirty intake valves and possibly a clogged injector. No need to get piston#3 replaced like the dealership wanted to do. Another update on this problem. After running great for a few months P0303 started coming back on and off, especially on cold days. Bought a compression tester, all 4 cylinders checked out properly. Ended up buying an injector from Rock Auto, replaced it and the problem is solved. Been running for over 6 months through cold winter weather with no issue.